Price is an obvious consideration so we’ll start here. Window tints are not exorbitantly expensive. Average prices range from $100 – $400 to tint your vehicle. Be careful of going for something much cheaper than $100 – cheap does not often equal quality because chances are it will look cheap too and not last as long as it should. 2. What Kind Of Quality? Your car window tint should be considered as an investment. Spending extra dollars on the job can mean the difference between a high-quality film or a cheap job. You want the product to last years and not months. Quality counts, not only because it shows but because you want to reap the benefits of automotive window film. Anything is possible when it comes to compromising your window film. Whether a brand offers a warranty or not will be a good indication of the quality on offer. Most brands will offer a warranty at no extra cost because they know that it provides you as the customer with the confidence needed to go ahead with the job. Warrantied tints cover you for faulty materials, should anything go wrong. 4. What Brand Options Are Available? The best brands are well-known for a reason. They offer quality and performance and have had the chance to prove that over and over again. Make sure to do your research into the brands on the market. From this research, you will be able to gauge the general opinion of the market towards these brands based on what people are saying. This, and the warranty offer and cost. 5. What Type Of Tint Technology Does The Tint Use? You want to go with a tint that offers you all of the benefits of the exercise including UV ray block, shattered glass protection, security during any theft attempt and of course that it offers you sufficient privacy. Tinted windows can block up to 99% of harmful rays such as UVA and UVB. Theses rays can cause skin ageing and premature aging. Whether you go with clear tint or a light tint, you’re able to block out these rays. If you’re spending a lot of time in your car, driving for work, or travelling often this will be a good investment. Tinting your vehicles windows means your upholstery in your car will maintain its quality. Because UV rays are blocked, your car’s interior is protected from fading and wearing from direct sun. Window film will prevent your cars windscreen from shattering, acting as protective tint should an object hit it. If you are in an accident, you and your passengers will be protected from flying pieces of glass bits as well as protection from being flung through the windscreen. When it comes to thieves trying to access your vehicle, they will not be able to smash your windows and enter through the window. Automotive window film will keep the contents of your vehicle safe from prying eyes which may threaten the safety of your belongings. Additionally, while driving, you and your passengers can enjoy privacy from other road users. 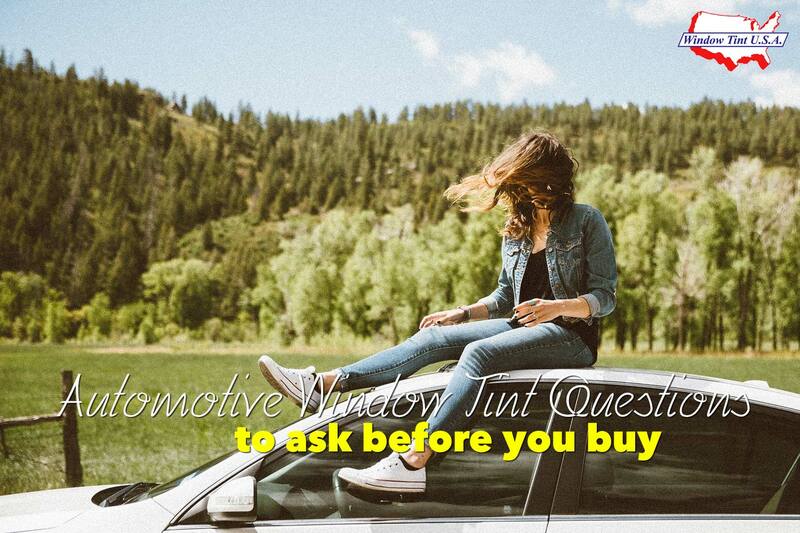 Keeping your car’s interior cooler can look smart with automotive window film but be sure to ask these important questions before you go ahead with the job. The benefits provide a good foundation for a valid investment that will serve you long after you’ve made your payment. Be sure to do your research and locate a reliable, high quality service provider. This way, your investment will stand the test of time.